What inspires you both in the kitchen and out? The style and dishes of my menu incorporate a number of influences - from my strong Filipino heritage to international culinary exposure to various French cooking techniques. And of course, I’m very much inspired by my family. Any chefs (foreign or local) you look up to? My favorite chef in the world is Thomas Keller, a very inspirational chef and restaurateur. I had the privilege to dine at all his restaurants in Napa Valley and I left each one in awe - of the food, the service and the “theatre” of it all. Here in Manila, I admire Chef Jordy Navarra and the food he is putting out at his restaurant, Toyo. He is a good ambassador for Filipino cuisine and culture and his food is innovative, wherein they’re prepared and executed at the highest level and attention to detail. Earlier in your career, you worked at Michelin-starred restaurants for internationally renowned chefs, what are you bringing from your experiences in many different parts of the world into your work at Hilton Manila? I’ve had the privilege of working in some elite and high-profile establishments in the world, with the finest chefs and the most savvy business professionals; and I’ve learned a lot from them over the years. Under the guidance of Chef Raymond Blanc, I was able to master the precision of Michelin Star quality cooking and discipline. Through my experience as Executive Chef and Manager at the Adelaide Oval, one of the largest Food and Beverage providers in South Australia, I learned how to handle pressure of taking on several roles at once. What are your favourite ingredients? Or what food/ingredients are always in your pantry? At Hilton Manila, we use the freshest locally sourced ingredients to help local farmers and promote sustainability, as well as advocating healthier dining. In my mind, fresh is best. When I am in Ilocos Norte where my wife is from, we get our vegetables from her family’s farm and you can really taste the difference and I love seeing my 2-year-old daughter learning about where her food comes from–from nature and not from a can or a plastic bag. I’m very simple – I love a good salad with fresh vegetables and a simple dressing or a toasted sandwich with roasted vegetables, boiled egg and roasted chicken or simple Club Sandwich will do for me! The simpler, the better. 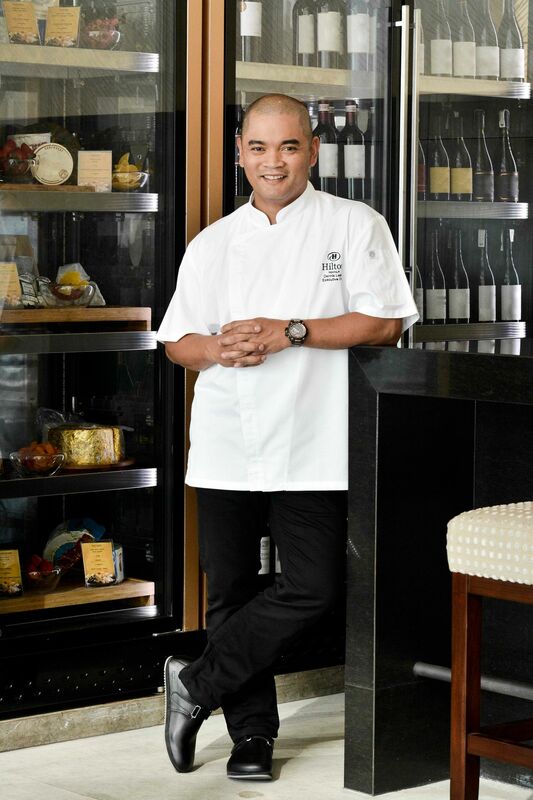 Being Executive Chef for Hilton Manila is considered a homecoming for you. How do you compare the Filipino cuisine experience when you enjoyed it back then and now? The food I used to prepare in Australia had predominantly Filipino flavors. Basically, I used locally produced and locally sourced, South Australian ingredients and injected Filipino flavors in preparing and cooking them. Now, it’s the other way around. I’m experimenting on how to give Filipino dishes little Australian touches. But I am finding it extremely exciting and satisfying to be preparing food with both of cultures always in mind. I am very proud of my Filipino/Australian heritage.